MSM have a long standing relationship with AFRA, we met Joseph and Rosie Kumar who run the home over 18 years ago on one of our first visits to India. The home was started by Josephs mother in a small two room dwelling and this was all that existed when we first visited them. When his mother died Joseph felt led by God to leave his job in Dubai and return to care for the children with his wife Rosie and children Samuel and Angel. 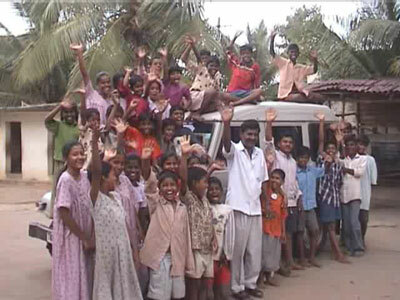 AFRA provides a loving home to 48 children aged between 4 and 21 years and Gods love is really evident here. There is prayer and worship each morning and evening and the children really enjoy this time and are ready to start even if the adults havent arrived!! On Sundays they attend the local Church which is walking distance from the home. The Pastor here is Josephs brother so there is a very close relationship with the local church. MSM have a long standing relationship with AFRA. Gods love is really evident here and the home has grown and developed in the subsequent years. MSM have supported the home for many years alongside local support from the surrounding areas. Now one of the local organisations has decided to end its financial support, leaving AFRA to be under threat of iminent closure, we are praying for additional support to protect the future of the children and this wonderfull home. In addition to a loving Christian home Joseph and Rosie are concerned to give each child the best educational opportunities to help secure the best possible future for them. There are a lot of costs associated with education, uniforms, shoes, books, tuition and transport, a couple of years age MSM were able to buy AFRA a second hand jeep so Joseph now drives the children to their different schools rather than them catching the bus which was expensive and crowded! The fees for further education can be very expensive but we are delighted that MSMs support is enabling them to have these opportunities and in this educational year one boy Sivakumar is in his final year of Engineering, two boy's are undertaking a diploma in mechanical engineering, two girls are studying for a diploma in teacher training and five boys are undertaking industrial training courses. AFRA is a registered Society and stands for Association for Rural Action and they have a heart in uplifting down trodden rural people. In addition to the Home they run a day care centre for under 5s. these are the children of local poor families who are mainly labourers which means both mum and dad have to work each day to earn enough to feed the family. Previously the children were either being taken on to building sites or left at home so AFRA started the day care centre to meet this need. 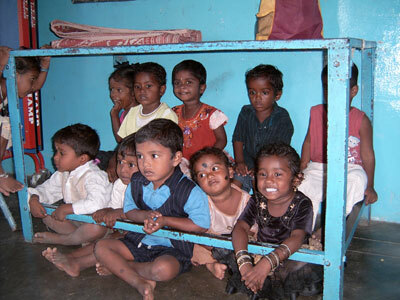 They employ one teacher to teach the children and they are also fed each day. In addition AFRA is supporting the educational costs of a number of children in the area, enabling them to stay with their families but still have the basic requirements they need. They have also given training to local people to increase their earning capacity, given blankets to the elderly and rice to families whose homes were destroyed in recent cyclones. Joseph and Rosie have applied to the Government for land and the vision is to rebuild the boys and girls home in separate blocks. Currently the girls are upstairs and the boys down but legally they should be accommodated in separate buildings. Also they have a vision to build a church, medical centre and vocational training centre for local people, Papa Rick has suggested they also build row houses simple houses which they could rent out to bring in income for their work. We were with them last November when they told by the Government Official that the land had been granted to them. Unfortunately the bureaucratic wheels turn very slowly at times and they have yet to secure this land, so we are praying the door will open for them soon as this is not the first time land has given and then taken away. Joseph and Rosie really do a fantastic job of loving and caring for these children and showing them the love of Jesus every day. They work very hard and only have two helpers, one lady who comes for a few hours to help wash clothes, this is done by hand on the floor under a water pump and another lady comes part time to help with the cooking. Last year they were delighted that one of the elder boys had finished his training got a job and then got married. AFRA was the base for the wedding and Joseph and Rosie were so proud to be his parents. When we were there he brought the wedding album to show us and it brings home to us the depth, scope and difference that AFRA Home has made to this mans life practically and spiritually.